Game wardens, park staff and biologists step up after hurricane wreaks havoc. Even though he’s worked on the front lines of Hurricanes Ike and Katrina with Texas game wardens, Texas Parks & Wildlife magazine Chief Photographer Earl Nottingham was surprised by what he saw in the days that followed what’s projected to be the costliest storm in U.S. history, Hurricane Harvey. Nottingham chalks it up to the Texas spirit, strong and full of hope, even in the face of catastrophe. 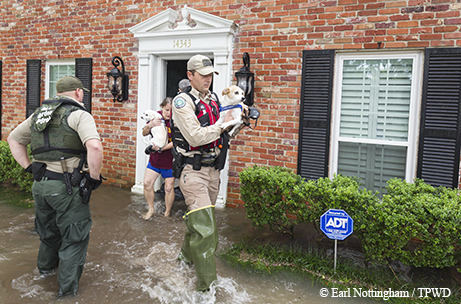 Nottingham spent five days gathering images of Harvey’s immediate damage, noting that despite the human tragedy, a sense of good humor prevailed as folks emptied out their freezers to barbecue for first responders and other survivors. Weeks later, he and photographer Chase Fountain have been documenting damage to Texas Parks and Wildlife Department properties, as others who work in the agency assess impacts to wildlife and fishing along the coast. Texas game warden Dustin Dockery awoke in the early morning hours of Aug. 27 and climbed on the roof of his Baytown home to throw a tarp over a leaky spot. He decided to stay up and called in to let the emergency operations center know he was available to take calls. Less than 10 minutes later, the first call came in, and another day of rescuing South Texans from floodwaters began. Hurricane Harvey had made landfall a few days earlier, pointing its powerful eyewall at Rockport and Port Aransas, creating wind and water damage along the Gulf Coast to Louisiana and inland to Houston and myriad smaller towns. Dockery sent his wife, Brooke, and their two tiny children (4 months old and 22 months old) to East Texas and safety with family. After a long day of rescue and recovery on the other side of Baytown, Dockery went home to catch a little sleep at around 10 p.m. Some homes were flooded in his neighborhood, but his was still dry. The situation had changed by midnight, however, when Dockery awoke and found water beginning to seep in. He quickly moved his car to higher ground and tried to relocate a few possessions out of harm’s way. The water had already risen to his ankles, so he headed off to the local fire station. Remembering some needed paperwork, he returned briefly home to grab it a few hours later and found 2 feet of rising water and furniture beginning to float. Dockery and longtime partner Daniel Pope continued running an airboat on missions from the firehouse. Exhausted, they tried to catch a few hours of sleep at the firehouse, but at 5 a.m. they were told to abandon the firehouse, with water rising. They took a military-style vehicle to another firehouse, but Dockery couldn’t even finish a cup of coffee there before the first call came in. Transported by dump truck back to the first fire station, Dockery drove the airboat right out (it was already floating) to rescue an officer trapped with his wife and 3-week-old infant. Dockery saw his house again on Tuesday from the airboat. This time, the water was nearly to the roof. The partners were part of a larger force of more than 250 other Texas game wardens and 90 state park police officers engaged in active search and rescue missions; some included K-9 units, rescue swimmers and aircraft, as well as more than 210 rescue vessels. 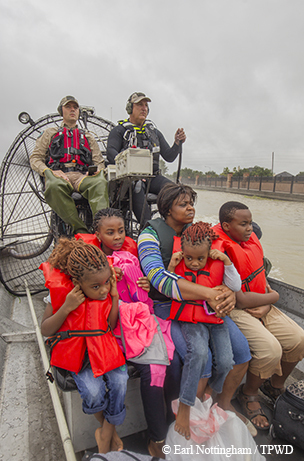 They were joined by game wardens from nine states, including Florida (128), Louisiana (67), South Carolina (28) and Arkansas (28), to rescue more than 10,000 people. Wildlife and Inland Fisheries personnel also assisted in the rescues. Like all those who served, Dockery focused on the needs of others but eventually had to face his own harsh reality. Luckily, he was not alone. “When people heard, the calls and texts came pouring in,” he says. 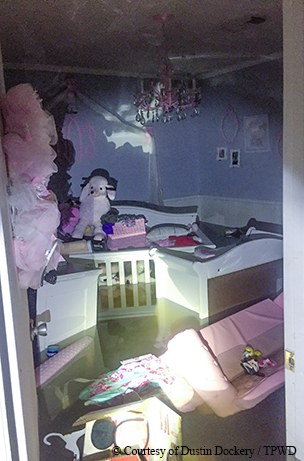 “They offered financial support, emotional support.” The Dockery family is now living in a trailer in their driveway, and the house has been gutted. With so much help, they hope to spend Christmas in a remodeled home, with a complete finish in six months to a year. Initial assessments by TPWD staff found about 30 properties that suffered damage from Hurricane Harvey: four wildlife management areas, 15 state parks, eight Coastal Fisheries facilities and two Inland Fisheries buildings. Damage included everything from missing shingles and siding to destroyed roofs and doors and fee booths. Brazos Bend State Park was inundated with more than 10 feet of water, compromising electrical components and the structural integrity of screened shelters, limited-use cabins, camping loops, a group dining hall, fishing piers and wildlife viewing areas throughout the park. 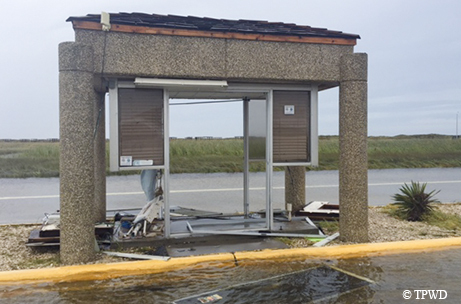 At Mustang Island State Park, the fee booth was heavily damaged, leaving only the concrete shell. The entire north-facing wall of a restroom was destroyed. More than 40 campsites, roads and a day-use parking area were still being assessed due to extreme damage to the area. 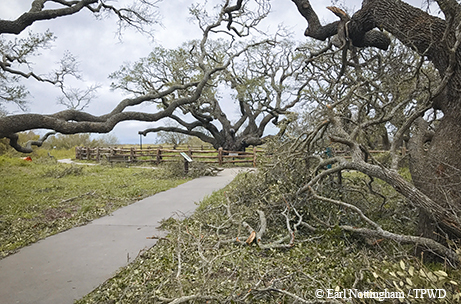 Goose Island State Park saw significant damage with roadways, bird-viewing platforms and signage decimated during the storm. The entire upper section of the fishing pier needs to be replaced as well as carports and wooden fences. The island retaining wall was also damaged. Walls in the headquarters, administrative office and maintenance buildings at Stephen F. Austin State Park were damaged. Electrical outlets will be replaced in more than 15 screened shelters, a limited-use cabin and four restrooms. More park and WMA damage will be assessed in weeks to come. Mustang Island State Park sustained significant damage to roads and buildings. When emergency shelters overflowed, 62 Texas state parks opened their gates wide to offer a temporary home to evacuees for the month of September. Fees were waived for more than 8,000 displaced Texans, who enjoyed the beautiful scenery and helpful hospitality they found there. Cynthia and Royce Williams from Rockport found themselves enjoying a month’s respite at Corpus Christi Lake State Park in Mathis. Every day they drove back to Rockport to work on getting their home livable for their children, who were staying with family in Magnolia. The Williamses remembered the first time they saw the damage to their “little piece of heaven” after Harvey’s fury. Royce grieved the trees Harvey ripped up. The couple still found a way to laugh between the tears and enjoy the beauty of their surroundings. Another Rockport resident, Stacy Barefield, says her apartment was condemned and she and her children slept on a mat in the yard the first two days. Like the Williamses, Barefield found enjoyment in the park facilities, lifting her spirits even in hard times. At Goose Island State Park, not far from where the eye of the hurricane made landfall, the iconic Big Tree stood strong. Many other trees lost limbs. After a few early reports of misplaced snakes and alligators, skunks and raccoons, most wildlife will return to their usual habitats after severe weather, says John Davis, TPWD Wildlife Diversity Program director. While it might take some time to complete assessments of long-term and short-term storm impact, most wildlife populations are fairly resilient. “These species evolved with hurricanes and floods, so they will recover,” he says. Many small mammals, reptiles and amphibians seek higher ground while waiting out storms. Deer will fare well, with just some loss of fawns, though some will have been old enough to swim to high ground. What could have the most impact, says TPWD Wildlife Division Director Clayton Wolf, is damage to habitat. Some late bird nests and nestlings could be affected by the storm, but most birds will survive. However, the prognosis is more guarded for some of the Coastal Bend’s waterbirds and shorebirds — roseate spoonbills, great egrets, snowy egrets, reddish egrets, great blue herons and black skimmers — that already have a tough time finding a safe place to nest, writes frequent Texas Parks & Wildlife magazine contributor David Sikes in the Corpus Christi Caller-Times. Both tree-nesters and ground-nesting birds have been affected. Those that nest higher up will find that Harvey downed many trees and bushes; ground-nesters will find their vegetated islands, dunes and sandbars changed or obliterated. Both types of birds need those rare spots with no threat from predators or humans; those habitats will be in even shorter supply now. Salinity issues are a concern for marine life, post-Harvey. It may take weeks for fish to return. The situation looks worse for Texas oysters. Oysters experience 90 percent mortality when salinity hits less than 2 parts per thousand. “With the volume of water that’s flowing through Galveston Bay, salinities will be 0 parts per thousand,” he cautions. Hunting and fishing license sales are not immune to the effects of Mother Nature. A decrease could have a negative financial impact on the agency, especially combined with property damage and emergency management costs, estimated to start at $50 million. Despite that, TPWD Executive Director Carter Smith prefers to shine a light on the people and programs who will lead the recovery.